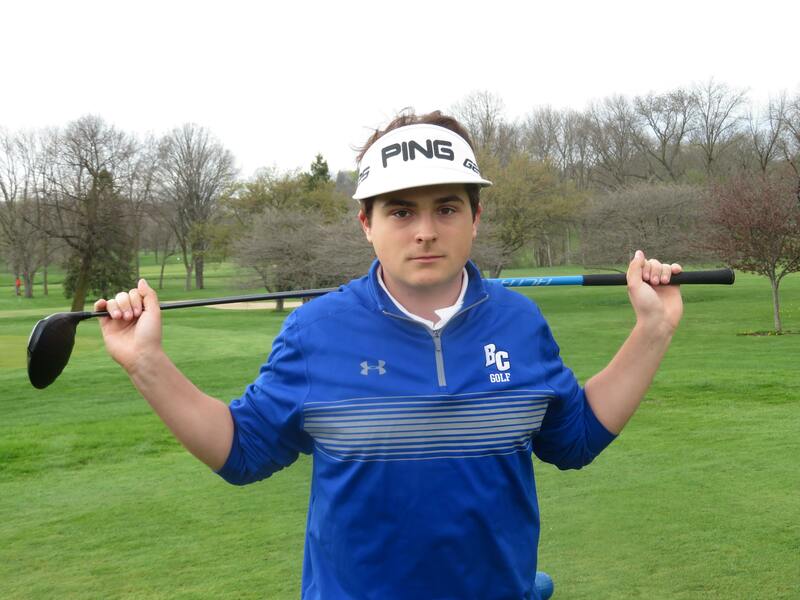 Believe it or not, if it wasn't for the Easter Bunny, Brookfield Central senior Brandon Talaska might not be on his way to college in the fall on a golf scholarship. Talaska - one of the big three on the Lancers golf team along with junior Zach Mindel and sophomore Jack Anderson - was first exposed to golf when he went to his grandma Gladys' house for Easter Sunday when he was 4 years old. "My grandma had a set of kids clubs in my Easter basket," he recalled. "Every time I went out there I would hit balls in the yard. Once I was old enough, around 7 or 8, she would take me to the Par 3 course." At the time, Talaska didn't realize he would fall in love with the game of golf. "I played a lot of baseball growing up," he said. "That was my sport. But once I finally got out to the big courses - my first ever round of golf was at Greenfield Park right by my house. I remember that day. I was 12 years old and after that day I would ask my dad (Robert) almost every week 'Can we go golf?' Can we go golf?' I started to really, really love the game. I just kind of faded away from baseball and wanted to play golf." While many kids growing up playing baseball imagined themselves in the major leagues hitting the walk-off homer or making the game-winning catch, Brandon had similar dreams about golf. "I liked the idea of imaging myself on TV when I was playing with my dad," he said. "I would have to putt in to win this, win that, stuff like that. We played a lot in the summer starting when I was in fifth grade." Brookfield Central golf coach Brian Scrobel had his eye on Talaska since his middle school years. "When Brandon was a student at Wisconsin Hills Middle School I knew he had a lot of passion for golf," Scrobel said. "I followed up on that and encouraged him to play in tournaments in the summer and be active in his role as a golfer. "I knew he was going to come out for the team because I knew he really liked golf. My motivation for him was to make sure he was getting lessons, making sure he was active in the Wisconsin Summer PGA Tour to play in tournaments and things like that. He was certainly very receptive to all that." 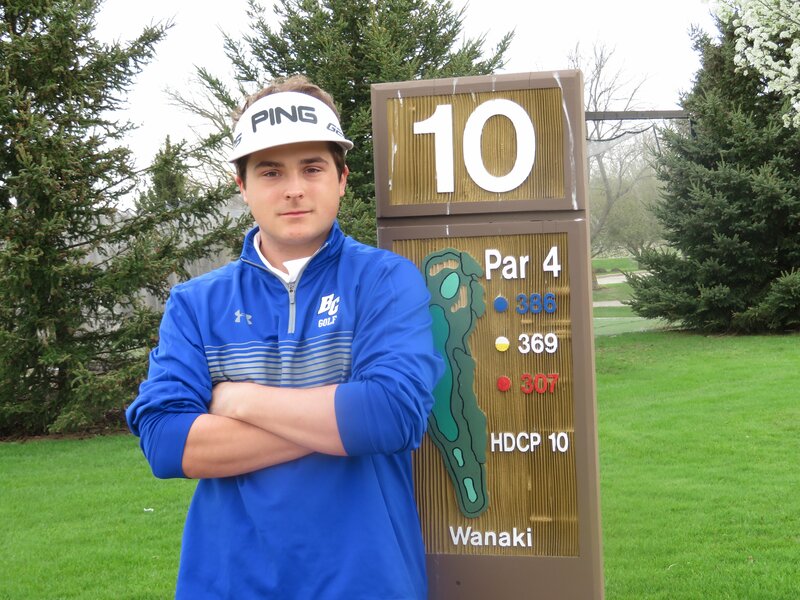 Talaska made the varsity as a sophomore and was in the Lancers' top five golfers. He is called 'Bubba" because his signature is a Ping visor he wears like professional golfer Bubba Watson. But Talaska doesn't come close physically to the 6-foot, 3 inch PGA star. "He placed very well and did a lot of good things," Scrobel said. "He also made third-team all-conference." But then an unusual thing happened in the winter of Brandon's junior year. He wanted to increase his strength and spend a lot of time in the weight room. "He never hit it really long his junior year," Scrobel said. "I guess we don't know what happened. He had gone through a tremendous about of work to lengthen his game. He spent as exorbitant amount of time in the weight room to get stronger. He was very diligent, very passionate about his fitness level. He lost weight. He got stronger, he really re-created his body. "With that being said, part of his golf game which suffered a little bit was his short game and his putting. He was longer off the tee with his irons but he wasn't able to save par and get up and down like he did his sophomore year. His scores reflected that and he had a hard time holding on to that position. Last year he didn't even get into our top five. "He went from having a 43.1 average to 43.9. He kind of went backwards a little bit. But it certainly wasn't for a lack of trying. He dedicates himself to golf. More than anyone else he was frustrated by not being able to see the results." Even though he spent time in the weight room that winter, Talaska focused on his golf game. "There was no way I was neglecting my golf game," Brandon was quick to point out. "I was going to the range at least three times a week. Once spring started to roll around I would see my (personal golf) coach. If it wasn't one thing going wrong it was another. "I couldn't find my stride. I wasn't totally imploding, I was just shooting a little bit under bogie golf. It was like I'm still close, but I'm not there. It was really frustrating. There was a lot of stress going on about my game." But true to form Brandon started to get his game together on the varsity reserve team. He was the medalist in the varsity reserve Greater Metro Conference tournament and made all-conference. And then Talaska began setting his sights on next season. "The varsity reserve season ends before the varsity's, so when the varsity guys were getting ready for state, I'm at Brown Deer my home course, then go straight to the gym. I knew if I had any chance at the future, I needed to do something about it. I was really determined about coming back." Talaska impressed Scrobel with his strong finish. "He has shown a lot of resolve," Scrobel said. "I'm sure he was upset about last year, but he didn't pack it in. He just said I'm going to fix that. He made a splash during the summer, because of him not liking how last year ended, it made him better. "That's the message to all the kids in the program. You own your game. It's a results business. We need to be able to get on the board and lower the scores and you are what you post. He's proved that this year." Scrobel then talked about Talaska's strengths. "His passion for the game. He develops a plan," he said. "He works diligently on his fitness. He has tried to re-create himself. He has good length off of the tee and now his iron play is out of this world. "His iron is high, he hits everything straight. His swing is very efficient right now. There is not a lot of moving parts. He's been making a lot of putts. We played at Blackwolf run and he had six birdies. He's unbelievable. He's doing a lot of really, really good things." Talaska is modest about his game. "My strength in my short game, my putter, but all around the board my game's pretty similar; there's not too much of one thing that stands out," he said. "Over the past two years I've really worked hard to get my distance out. My sophomore year I would hit my 150 club, which is a 7-iron. It's a baby 9-iron now. In my mind, every par 5 is like a birdie. Scrobel knows that Talaska will be golfing next season for Alderson Broaddus University in Philippi, West Virginia. He talked about what Brandon needs to work on. "He'll still let an errant shot turn into a double (bogey)," the veteran coach said. "We want to clean up those messes. We say we can always live with a bogey, you can always recover from a bogey, but doubles and triples are hard to recover from. His level of play has gotten so much better, we're just trying to eliminate the big numbers." Scrobel then pointed out Brandon's role this year. "He used last year as motivation, that when the summer season started he was awesome," he said. "He qualified in rounds in the low 70's. This summer he was really, really playing very well. He is certainly one of our top three this year. "What we look for from him is stability. He has the ability to shoot low scores. We want him to be comfortable. We want him to be like our rock; that there's no wavering whether he's hitting the ball well or not, we can always count on his game to get him points where he is helping our team score. "He knows that he does not have to carry this team. We have three golfers who are all ridiculously talented and have a line of very good scores and that relives some of the pressure." Talaska's personality also affects the team in a positive way Scrobel said. "He's a great kid. I'm really proud to have him in our program. He's an absolute joy to be around. Kids love hanging out with him. His charisma is one of the things that allows us to feel relaxed and get ourselves in a good place. "At the same time holds himself accountable to be a good golfer. He is a student of the game, knowledgeable about the game. Those factors together will allow him to be very successful this year." FAVORITE MOVIE: 'Star Wars 3' , Horror Movies. MOST MEMORABLE SPORTS MOMENT: Winning regional as a freshman. WHAT WOULD YOU LIKE TO DO IN THE FUTURE? Accepted scholarship to play golf at Alderson Broaddus University in Philippi, West Virginia. Would like to study Pyschology.